Mash 2 cups berries with 1/4 cup sugar in medium bowl. Beat cream cheese and remaining sugar in large bowl with mixer until blended. Add mashed berries; beat on low speed just until blended. Gently stir in COOL WHIP; spoon over crust. Refrigerate 6 hours. Run knife around rim of pan to loosen cake; remove rim. 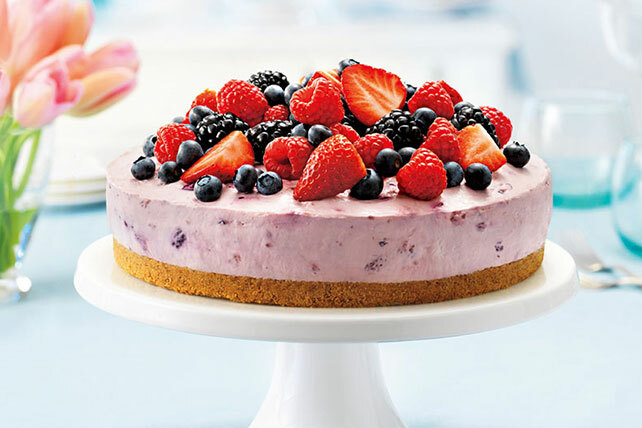 Top cheesecake with remaining berries. Save 50 calories and 5g of fat, including 3g of sat fat, per serving by preparing with PHILADELPHIA Neufchatel Cheese and COOL WHIP LITE Whipped Topping. Prepare using thawed frozen mixed berries.